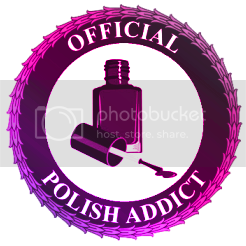 Today's guest post comes from my polish friend Destany over at Confessions of a Sarcastic Mom. She makes really cool frankens and always does great layering combos. Hi everyone! I am so honored to be guest posting here at Refined and Polished! I'm glad to help Lakeisha out as she furthers her studies! 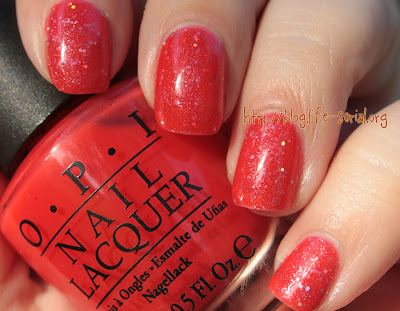 I used OPI Big Hair, Big Nails as my jelly polish and OPI Teenage Dream as my glitter. 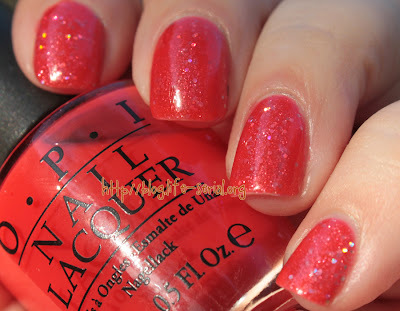 I just love how the glitter appears suspended in that top coat of jelly. Just gorgeous :) Do you guys like jelly sandwiches? What are your favorite combos? You all know I love a jelly sandwich and this one is super pretty and sparkly! I think I did one of my first sandwiches with this same polish. I got a few New York Summer jellies in the mail last week and Destany is making me want to do a sandwich stat. Make sure you head over to Confessions of a Sarcastic Mom to check out more from Destany. I really like the way this turned out! I need to try this again! I really love the colors also they fit so good together!